Denuvo has received a major blow from a previously unknown group called 'SteamPunks' after the hackers successfully released a keygen to allow players to bypass Denuvo in Dishonored 2. The keygen allegedly generates "real licenses" for Denuvo, giving the possibility that piracy protection maker is in serious trouble. 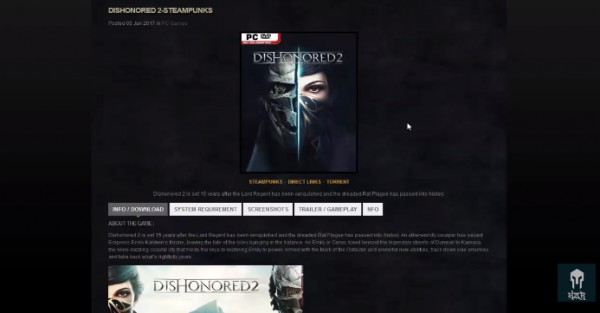 According to an image posted on the Piracy subreddit, Steampunks claimed that the key generator will unlock Dishonored 2, which is a Denuvo V3 game protected by the latest version of Denuvo's anti-piracy system. Instead of taking the traditional way of hacked code -- pre-crack (remove the protection) and deliver it to the public - SteamPunks' release appears to contain code that enables players to generate Denuvo licenses on a machine-by-machine basis. What's more interesting is that a certain theory surfaced that this key generator could do the same to all Denuvo-protected releases in the future. As to how SteamPunks' tool works, TorrentFreak noted that the hacker group could have chosen to safeguard their code with VMProtect, which is the software system previously deployed by Denuvo to prevent people from reverse-engineering its own code. Although many cast doubts for potential security risks, several users have reported that the keygen actually worked and so far there have been no reports of malware or unwanted software being installed, Segment Next reported. Meanwhile, a hacker named Baldman also appears to have set a new code for cracking Denuvo's product. Baldman claimed to have beaten the Tekken 7 protection, which was released just four days ago. The news also followed just two months after Mass Effect: Andromeda was cracked even though it was protected by both Denuvo and EA's Origin platform, and just five months after Resident Evil VII was cracked in less than a week. Other games were also cracked just a few days after release including RiME in five days and Prey in 10.